Teleporter Room map, Boss Music, and Boss Damage Chart. This boss gauntlet sets the tone for (most of) the rest of the series, with rematches taking place in one group at the end instead of scattered throughout the Wily stages. While we get large health refills after each boss, there are none for energy, so we have to manage what we have effectively. Of course, we just used all of our Crash Bombs on the last boss, so those aren't available unless we game over or had taken advantage of the fact that the bombable walls in that fight do not regenerate between lives. Heat Man starts the fight by tossing three fireballs at us in an arc, which are rather difficult to dodge. These are aimed around your position, so it's easy to back away from them if you're close. Otherwise, your best bet is to jump or stand between the highest and middle shots. Mega Man's own shots will interrupt him, forcing him to put up a flame shield that blocks any subsequent shots, after which he'll dash toward you as a beam of fire. While the projectiles can be scary, locking him into this second attack will make him very easy to avoid, though his defense means this will take a while. Bubbles kill him much faster and are the only weapon worth using against him. 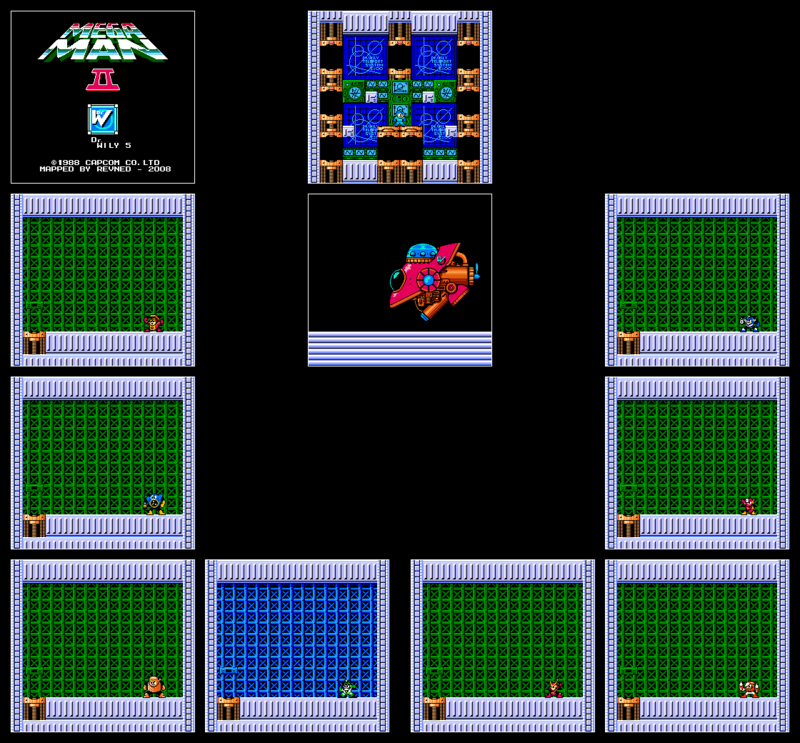 Air Man throws out one of five patterns of wind projectiles, which are stationary for a moment before accelerating across the screen. After doing this three times, he'll make two jumps to the other side of the screen and repeat. Simple enough, but the whirlwinds deal four damage, and even the easy ones are difficult to dodge due to their changing speed. The first three are fairly simple, the fourth requires a short hop, and the last takes two perfect hops that I've never pulled off in a normal playthrough. Though this seems difficult, Air Man takes two damage from normal shots and you can easily win a damage race by just walking toward him at all times and firing. He's only dangerous if he can scare players into defensive tactics, though he does a fine job of it. Leaf Shield is his only major weakness. Wood Man creates a shield around himself, sends four leaves into the air, then throws the shield as the leaves come down, after which he hops forward and repeats. Though the pattern is always the same, getting through the falling leaves requires some good timing, and Wood Man will be happy to press you into the wall if you let him. Mega Man probably isn't going to kill him before that happens without a weapon, so the only way to get around without taking damage is to jump over his shield and run under him in one motion. Wood Man is simply a timing challenge, but his fight is visually interesting and confusing enough to make him one of the harder bosses in the game. Atomic Fire is his true weakness, but the Air Shooter can kill him through the shield, and even Metal Blades will at least kill him before he crosses the room. Bubble Man's fight takes place underwater, and he'll swim up and down while shooting at you and dropping bubbles that bounce along the bottom. This is actually easier than the first fight, as he had a row of spikes across the ceiling there. He has no particular pattern but is fairly mobile, meaning you'll simply have to outfight him. Metal Blades work best here, though Quick Boomerangs are also better than your Buster. Quick Man moves fast, can jump at various heights or run along the ground, has a spread of projectiles that will stop once in mid-air before turning towards you, and he has no pattern to speak of. Even though he lost the advantage of having staggered terrain in the second round, this is still a very difficult fight, and the only thing going your way is that normal shots deal two damage to him. It's important to try to dodge him, but you'll want to keep damaging him constantly to stay ahead. Unlike everything else in the game, Time Stopper will actually damage him at half the rate it drains, so opening with this gives you an excellent shot at winning a damage race. After that, only Crash Bombs or a charged Atomic Fire deal significant damage to him, but you're better off sticking with the Buster. Crash Man walks back and forth, and jumps to throw a bomb downward whenever you shoot at him (or when he feels like it, if you're taking too long). That's it. Since he reacts to you, it's very easy to lock him into a pattern of jumping over the middle of the screen and walk under his bombs. However, he jumps quickly enough that you'll want to fire above him. Winning this takes a while with the Buster since you'll lose control of the fight by shooting too much, but the Air Shooter brings him down quickly. One other oddity about this fight is that he won't walk into the corners of the room, though he can jump there. Metal Man lost a great deal of potency here, as the fight originally takes place on a conveyor belt that switches direction now and then. He's a fun and unique boss to fight, as he stays in one place the whole time (or jumps to the other side if you get too close) and will constantly jump and fire blades, forcing you into a ranged duel. How high he jumps determines how many he throws, as he'll fall further after each shot. He always fires directly at you so he can be manipulated into missing with most of them, but since his actions are random it can be hard to keep this up. Boomerangs are the best weapon to use against him on the first go, but he actually dies in two hits to his own weapon. Flash Man also lost his terrain advantage here, and this hurts him far more than it did Quick Man. He'll walk back and forth across the screen, occasionally stopping to freeze you in place before firing a spray of bullets at you. He's easy to jump over on flat ground, and he gives enough warning before the time stop to give players a chance to get in the air, but he'll hop and move toward you anytime you shoot him. Once again, Metal Blades are the weapon of choice here. Mega Man 2 bosses in their natural habitat. Overall, this is a fantastic assortment of bosses. We've got Wood Man as a precision timing challenge (like an upgraded Ice Man) and Air faking being the same. Heat, Crash, and Flash are generally dangerous but with exploitable patterns, Quick and Bubble fight more freely, and Metal does the same with a unique twist. Even though Quick and Air very nearly force Mega Man to take hits, both take extra damage from the buster and are meant to be taken down quickly. I suppose my only complaint would be that Crash and Heat are boring to fight when their patterns are known, while also taking the longest to kill with the Buster. Still, these are a big step forward from the first game both in the visuals and the energy these fights have. I find it a little easier to avoid Quick Man on flat ground since I have more time to judge where he's going to land from a jump and more room to avoid him. I also tend to get caught mid-jump a lot when moving around on his normal room. You do lose the chance to pump a bunch of shots into him while he's running into a wall though. Wily's machine once again sticks to two forms with one projectile each. The first fires in a low arc based on your position, and the second is a series of bouncing shots similar to Bubble Man's. While the first is easy to avoid by staying against the wall, the second is a nightmare due to the awful hit detection on these shots. I froze the room for a moment to test this out. The first two shots are me taking a hit while nowhere near the shot, and the last is how close I can stand before taking a hit from the side. The thing is roughly 50% bigger than the sprite suggests. Regardless, it's not a very interesting fight. Wily takes damage as fast as you can dish it out like all the other special bosses, so avoiding damage from the first form leaves you more than enough health to gun him down recklessly on the second. Crash Bombs deal the same amount of damage they use per shot, so a few quick bursts of those will take out either form quickly. A fully charged Atomic Fire takes off half the first form's health, but nothing else will work better than your Buster. However, Metal Blades can hit both forms more easily and the second is also weak to Quick Boomerangs, which are much easier to use thanks to the arc.